Moving into a new home means decorating, painting, hanging up family photos & covering up the empty & plain walls! We love to use wall decals & stickers around our home, they are easy, fun & are the perfect addition to any room! I was recently introduced to RoomMates, a company that creates fun, festive & chic wall decals, wallpaper, borders & even murals for the entire home. At RoomMates you will find your favorite childrens characters like Toy Story, Finding Nemo as well a variety of quotes, kitchen-themed decals & more! With RoomMates wall decals, you can give any room a new look with out breaking the bank & hassling with traditional decorating options! 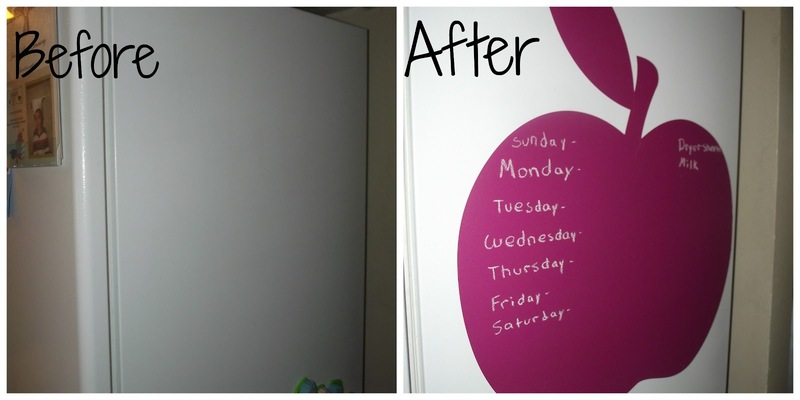 After browsing RoomMates wide selection of wall decals, I noticed they also had chalkboard & dry erase decals available. I've always loved the idea of having a chalkboard surface to write meals, shopping lists or to-do lists on in my kitchen. So, I decided on the pink apple chalkboard wall decal & since my kitchen walls aren't finished yet-I still have to texture & paint them, guess where my new wall decal went? On the side of my fridge, yep, it was the perfect place for it & we walk pass it a dozen times a day so I was sure that it would get seen! When my package arrived, it took just seconds for me to open up & get to work. The decals are all nicely placed on one sheet, just peel them off & apply them to your surface, in my case the side of the fridge. Smooth out your decal & your done, it was super easy to do, then just grab your chalk & have fun! Chalkboard is so much fun! What are some of your favorite items at RoomMates? I think their custom made wall decals & growth charts are pretty cool! Stay connected with RoomMates on Facebook & Twitter! I am going crazy! I just took a look at the Country Wall decals and they are so gorgeous! These wall Decals are not expensive, and I am going to take a look at getting one! I love, love, love the chalkboard wall decal. It's the perfect alternative to painting an entire wall a boring black chalkboard color. Love the idea of re-positionable chalkboards and dry erase boards. The Dry Erase Pirate Map would be great for a boy's pirate birthday party.